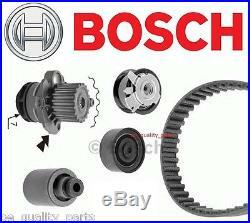 ORIGINAL GENUINE BOSCH TIMING BELT KIT + WATER PUMP - BEST OE QUALITY. 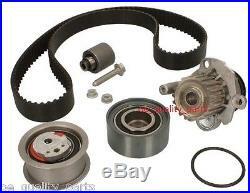 ORIGINAL GENUINE BOSCH TIMING BELT KIT. ORIGINAL GENUINE BOSCH WATER PUMP WITH GASKET. ALL LISTED ITEMS PACKED IN ONE ORIGINAL BOSCH BOX. AUDI A3 (8P1) 2.0 TDI 100kW 1968ccm 136PS UP TO YEAR 2007/01 ENGINE: AZV. AUDI A3 (8P1) 2.0 TDI 16V 103kW 1968ccm 140PS UP TO YEAR 2007/01 ENGINE: BKD. AUDI A3 (8P1) 2.0 TDI 16V quattro 103kW 1968ccm UP TO YEAR 2007/01 ENGINE: BKD. AUDI A3 (8P1) 2.0 TDI quattro 100kW 1968ccm 136PS UP TO YEAR 2007/01 ENGINE: AZV. AUDI A3 Sportback (8PA) 2.0 TDI. 100kW 1968ccm 136PS UP TO YEAR 2007/01... AUDI A3 Sportback (8PA) 2.0 TDI 16V 103kW 1968ccm 140PS UP TO YEAR 2007/01 ENGINE: BKD. AUDI A3 Sportback (8PA) 2.0 TDI 16V quattro 103kW 1968ccm 140PS UP TO YEAR 2007/01 ENGINE: BKD. AUDI A4 (8EC, B7) 2.0 TDI 100kW 1968ccm 136PS 2004/11->2008/06. AUDI A4 (8EC, B7) 2.0 TDI 125kW 1968ccm 170PS 2006/06->2008/06. AUDI A4 (8EC, B7) 2.0 TDI 89kW. AUDI A4 (8EC, B7) 2.0 TDI 120kW 1968ccm 163PS 2006/06->2008/06. AUDI A4 (8EC, B7) 2.0 TDI 93kW. AUDI A4 (8EC, B7) 2.0 TDI 16V 103kW 1968ccm 140PS 2004/11->2008/06. AUDI A4 (8EC, B7) 2.0 TDI quattro 125kW 1968ccm 170PS 2006/06->2008/06. AUDI A4 (8EC, B7) 2.0 TDI quattro 120kW 1968ccm 163PS 2006/06->2008/06. AUDI A4 Avant (8ED, B7) 2.0 TDI. AUDI A4 Avant (8ED, B7) 2.0 TDI 16V 103kW 1968ccm 140PS. AUDI A4 Avant (8ED, B7) 2.0 TDI quattro. AUDI A6 (4F2, C6) 2.0 TDI 103kW 1968ccm 140PS 2004/07->2008/10 ENGINE: BLB. AUDI A6 (4F2, C6) 2.0 TDI 100kW 1968ccm 136PS 2004/07->2011/03 ENGINE: BNA, BRF. AUDI A6 (4F2, C6) 2.0 TDI 89kW. AUDI A6 Avant (4F5, C6) 2.0 TDI. 103kW 1968ccm 140PS 2005/06->2008/10 ENGINE: BLB. 100kW 1968ccm 136PS 2005/06->2011/08 ENGINE: BNA, BRF. CHRYSLER SEBRING (JS) 2.0 CRD 103kW 1968ccm 140PS 2007/07->2010/12. CHRYSLER SEBRING kabriolet (JS) 2.0 CRD. DODGE AVENGER 2.0 CRD 103kW 1968ccm 140PS 2007/06->.. DODGE CALIBER 2.0 CRD 103kW 1968ccm 140PS 2006/06->.. DODGE JOURNEY 2.0 CRD 103kW 1968ccm 140PS 2008/06->.. JEEP COMPASS (MK49) 2.0 CRD 103kW 1968ccm 140PS 2006/08->... JEEP COMPASS (MK49) 2.0 CRD 4x4. JEEP PATRIOT (MK74) 2.0 CRD 103kW 1968ccm 140PS 2007/02->..
JEEP PATRIOT (MK74) 2.0 CRD 4x4. MITSUBISHI GRANDIS (NA_W) 2.0 DI-D 100kW 1968ccm 136PS 2005/09->.. MITSUBISHI GRANDIS (NA_W) 2.0 DI-D 103kW 1968ccm 140PS 2007/02->.. MITSUBISHI LANCER SPORTBACK (CX_A) 2.0 DI-D 103kW 1968ccm 140PS 2008/06->.. MITSUBISHI LANCER sedan (CY/Z_A) 2.0 DI-D 103kW 1968ccm 140PS 2008/01->.. MITSUBISHI OUTLANDER II (CW_W) 2.0 DI-D.
MITSUBISHI OUTLANDER II Van (CW_W) 2.0 DI-D 103kW 1968ccm 140PS 2006/12->2012/11. SEAT ALTEA (5P1) 2.0 TDI 100kW. SEAT ALTEA (5P1) 2.0 TDI 16V 103kW 1968ccm 140PS 2004/03->... UP TO CHASSIS NUMBER 5P-7-000 000 ENGINE: BKD. UP TO CHASSIS NUMBER 1P-7-000 000 ENGINE: BKD. SEAT TOLEDO III (5P2) 2.0 TDI 100kW 1968ccm 136PS 2004/09->2009/05 UP TO CHASSIS NUMBER 5P-7-032 500. SEAT TOLEDO III (5P2) 2.0 TDI 16V 103kW 1968ccm 140PS. 2004/04->2009/05 UP TP CHASSIS NUMBER 5P-7-032 500. VW GOLF PLUS (5M1, 521) 2.0 TDI. UP TO CHASSIS NUMBER 1K-6-650 000 ENGINE: AVZ. VW GOLF PLUS (5M1, 521) 2.0 TDI 16V 103kW 1968ccm 140PS. VW GOLF V (1K1) 2.0 TDI. 100kW 1968ccm 136PS 2003/10->2008/11 UP TO CHASSIS NUMBER 1K-6-250 000 ENGINE: AZV. VW GOLF V (1K1) 2.0 TDI 16V 103kW 1968ccm 140PS 2003/10->2008/11 UP TO CHASSIS NUMBER 1K-6-250 000 NOT FOR BMM ENGINE. VW GOLF V (1K1) 2.0 TDI 16V 4motion 103kW 1968ccm 140PS 2004/08->2008/11 UP TO CHASSIS NUMBER 1K-7-000 001 NOT FOR BMM ENGINE. VW GOLF V Variant (1K5) 2.0 TDI. UP TO CHASSIS NUMBER 1K-6-250 000 ENGINE: AZV. VW GOLF V Variant (1K5) 2.0 TDI 16V 103kW 1968ccm 140PS 2007/06->... UP TO CHASSIS NUMBER 1K-6-250 000 NOT FOR BMM ENGINE. VW GOLF V Variant (1K5) 2.0 TDI 4motion. UP TO CHASSIS NUMBER 1K-7-000 001. VW JETTA III (1K2) 2.0 TDI 100kW 1968ccm 136PS 2005/09->2010/10 UP TO CHASSIS NUMBER 1K-6-899 000 ENGINE: AZV. VW JETTA III (1K2) 2.0 TDI 16V 103kW 1968ccm 140PS 2005/08->2010/10 UP TO CHASSIS NUMBER 1K-6-899 000 ENGINE: BKD. VW PASSAT (3C2) 2.0 TDI. UP TO CHASSIS NUMBER 3C-6-300 000 BMR. 90kW 1968ccm 122PS 2005/08->2006/07 UP TO CHASSIS NUMBER 3C-7-000 001. UP TO CHASSIS NUMBER 3C-6-300 000 ENGINE: BKP. VW PASSAT (3C2) 2.0 TDI 16V 4motion 103kW 1968ccm 140PS 2005/03->... VW PASSAT Variant (3C5) 2.0 TDI. 90kW 1968ccm 122PS 2005/08->2006/02 UP TO CHASSIS NUMBER 3C-7-000 001. 100kW 1968ccm 136PS 2005/08->2010/11 UP TO CHASSIS NUMBER 3C-6-300 000. UP TO CHASSIS NUMBER 3C-6-300 000 ENGINE: BMR. VW PASSAT Variant (3C5) 2.0 TDI 16V 103kW 1968ccm 140PS 2005/08->... VW PASSAT Variant (3C5) 2.0 TDI 16V 4motion 103kW 1968ccm 140PS 2005/08->... UP TO CHASSIS NUMBER 3C-6-300 000 BKP. VW TOURAN (1T1, 1T2) 2.0 TDI 100kW 1968ccm 136PS 2003/02->2010/05 UP TO CHASSIS NUMBER 1T-6-185 466. VW TOURAN (1T1, 1T2) 2.0 TDI 16V 103kW. 1968ccm 140PS 2003/08->2010/05 UP TO CHASSIS NUMBER 1T-6-185 466. GENERALLY, ALL OUR ITEMS ARE HELD IN STOCK. NO WAITING PERIODS, IMMEDIATE DISPATCH. CUSTOMERS SHOULD SATISFY THEMSELVES THAT ANY ITEM CHOICE MADE IS SUITABLE FOR THEIR INTENDED PURPOSE OR USE. The item "GENUINE BOSCH TIMING BELT KIT + PUMP AUDI A3 A4 A6 VW SEAT GOLF V PASSAT 2.0TDI" is in sale since Wednesday, January 28, 2015. This item is in the category "Vehicle Parts & Accessories\Car Parts\Engines & Engine Parts\Other Engines & Engine Parts". The seller is "oe_quality_parts" and is located in Bialystok. This item can be shipped worldwide.